This is sort of a Lack of Progress Report. Getting out of Sauvie Island, Portland, and Oregon has proven to be a lot harder than we ever realized. We’re currently battening down to weather a wet winter out here on the island. Yesterday we wrapped the outside water hose that brings fresh water into the trailer with something called “heat tape,” which is not tape at all, as it is neither flat nor sticky. If I’d known that we could have saved a week of looking for the damn stuff. Now I’ll plug it in and see if it melts the hose, as the box warned it might. Under the category of “Making the most of it,” new and fascinating things continue to occur out here. The most amazing is the return of the Canada geese. They start arriving just about the time the sun goes down. 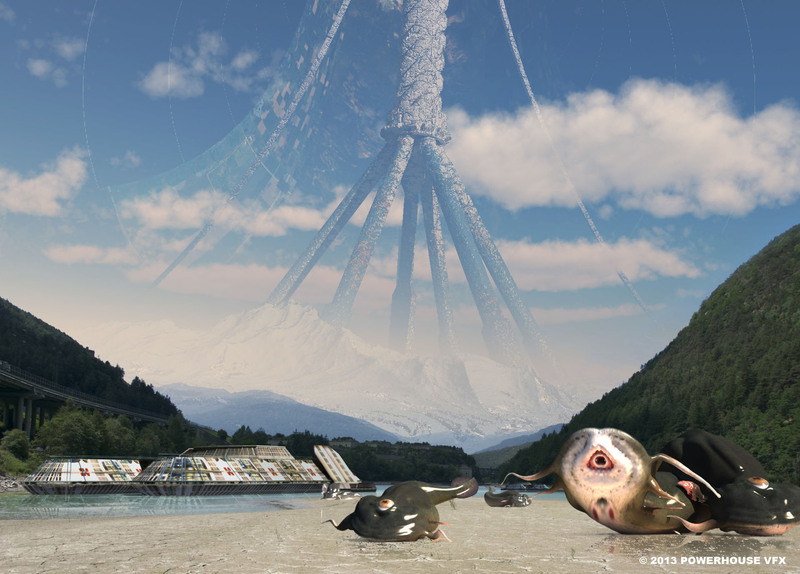 And arriving, and arriving, and arriving … They travel in huge V-formations that are constantly rearranging themselves. They make an incredible noise as they fly overhead. 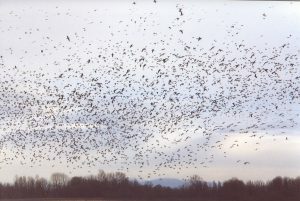 The first time I noticed this I gazed up at the sky in awe as hundreds and hundreds of geese flew over. Then I was completely knocked out when I realized I was seeing only a fraction of them. From the northern horizon to where our southern view is blocked by trees, they covered the whole sky. In the north many of them were so far away I couldn’t even make out individuals; it was like lines of smoke moving across the sky. So eventually they all passed, gabbling distantly somewhere to the west of me. And I was about to go back inside when … more geese. Even more than before. Thousands, easily. As they diminished in the ever-darkening sky, a third wave arrived. They kept arriving in waves until it was too dark to see them, but I could hear them passing overhead. But they’re flying west. I thought they headed south for the winter. Did they hear the forage was better in Japan? But why? Something wrong with the forage here on Sauvie? Of course, sometimes it sounds like Kosovo here, with multiple shotgun blasts punctuating the early morning hours, but I assume they are hunted in Washington, too. Aren’t they? And anyway, when did game birds get so smart they avoided flying into a nest of hunters? There are a number of U-pick businesses that sell mostly berries, peaches, apples, and some corn. What’s impressive is the incredible waste of these operations. Every peach and apple tree has as many rotting fruits lying beneath it as are still on the branches. I looked in awe one day down a row in a large planting of tomatoes and saw nothing but red, mushy fruit completely covering the ground, between the plants still heavy with red and gold and green tomatoes. My guess would be that one tomato makes it to market for every ten that grows. Probably even worse than that. The biggest operations out here are Kruger’s and the Pumpkin Patch. Kruger’s is basically a growing operation for a small chain of high-end grocery stores, where you can pay $3/pound for a pretty decent tomato. Out here you can buy the same tomato for 75 cents/pound, or pick it yourself for 25 cents. We sometimes shop there, but the sweet corn is better at the Patch. With the arrival of colder weather, the various fields growing varieties of squash began to die off, revealing the fruits laying on the ground. Acres and acres and acres of these fields contain pumpkins. Millions of pumpkins. Like somebody had laid a bright orange carpet over the dirt. The weekend of the 14th we were returning from the city when we pulled up at the back of a long line of cars. A traffic jam, here on pastoral Sauvie Island. Ten minutes later we reached the PP. I was stunned. In what had been, until a month ago, cucumber and lettuce and bean and pea and clover fields, on both sides of the road, hundreds of cars were parked, or circling slowing looking for a place to park. A sheriff was directing traffic. Pedestrians streamed across the road in both directions. Those returning to their cars were pushing shopping carts overflowing with huge pumpkins. Many of those heading toward the PP buildings were coated up to their knees in mud. The parking lots were quagmires of mud. Maybe a hundred Waremart shopping carts were sitting a foot deep in puddles of brown water, abandoned, looking like some odd mechanical herons waiting for a meal to swim by. Another hundred were on their sides in gooey gumbo. Halloween has grown enormously since I was a child. You start seeing black and orange stuff in early September now, when one’s thoughts traditionally should be turning to the mass madness known as Xmas. Used to be, you might carve a pumpkin and put it outside with a candle in it. Or you could just leave your porch light on and hand out home baked cookies. There were masquerade parties, sure, but I don’t remember going to any of them. A costume usually consisted of a 49-cent plastic mask or an old sheet. Today, a family might put out several dozen pumpkins, plus another dozen plastic ones. There are Halloween lights to string. Costumes can cost a lot of money. You may want to make a “harvest time” display in your window, with ornamental squash and corn stalks and a stuffed scarecrow. The Pumpkin Patch will sell you pumpkins, and squash and cornstalks and scarecrow stuffing, too. Everything for autumn but the turkey. I got no problem with any of that. But why Sauvie Island? The odd thing is, pumpkins are very little cheaper out here than they are at Safeway. Why wallow in the mud? Is it like the family going out together in the snow the cut down a Xmas tree in a field where they’re grown commercially? A fun family outing, “quality time” with the kids? I guess that must be it. The kids did seem to be having fun. In the distance we could see the “hay rides” the Patch had been advertising all summer. It was a tractor pulling no less than three flatbed trailers down a muddy road, all three of them packed solid with people. Beyond that was a giant field paved with pumpkins, dotted with people looking for the perfect one … only nobody comes here to buy just one pumpkin. The next week it rained again. It rained a LOT. And last Sunday at about 6 PM we were once more returning from the city when I saw an even worse traffic jam across the Multnomah Slough, which separates Sauvie from the mainland. We crossed the bridge—the only way to get to the island without swimming—and the cars were packed solid across it, maybe ten or twelve getting across the bridge each time the light changed. So I drove on the road facing the line of cars, as no one but us was driving TO the PP at that time of day. The traffic stretched over a mile. When we got to the PP, we saw there were still more than a hundred cars in the lots, and people were still streaming across the road with armloads and cartloads of orange. It was madness. The puddles of mud had become lakes of mud, oceans of mud. Cold-water swamps. We saw more than a dozen cars mired up to the headlights, so deeply stuck I figured the owners’ best bet was to come back in June with a backhoe. I fancied I might be looking at an automotive La Brea Tar Pit. If you dug down ten feet you’d find the fossilized remains of extinct cars from the Eisenhower Epoch: Studebakers, Packards, Hudsons, Nash Ramblers. Dig a little deeper and you’d uncover layers of Crosleys, Auburns, La Salles, Hupmobiles, skeletons still sitting grimly at the wheel, determined to find that perfect, cheap pumpkin. A few fathoms under that would be primitive models right off the primordial assembly line, cars with manual starting cranks, kerosene headlamps, isinglass windshields, vestigial harness leather and fringe-lined canvas tops. Beneath that, only buckboards and Conestoga wagons. Other cars were being rocked out of lesser quicksand by people who seemed to be constructed entirely of mud. Nobody looked to be having a lot of fun. I take it back. I think the owners of SUVs were enjoying the hell out of it. I figure those 20, 30, or 50 thousand dollar pickups and other juggernauts usually come in handy about once a year in Portland: the day it snows. (Last year we skipped that day. No snow last winter.) (Of course, most of those SUV owners haven’t yet learned that a 4-wheel drive vehicle doesn’t brake even one inch shorter than a sedan when driving on ice …) So here was their first chance of the year 2000 to get their money’s worth, and I could almost hear them cackling as they sprayed mud from all four wheels onto the miserable car owners. Eat my dirt, peasants! So the Pumpkin Patch is a lot like the many retailers who do 30, 40, or 50% of their business in the month of December, I guess. Only out here the gold mine is October. We did discover what I now think of as Sauvie Island’s Dirty Little Secret, though. Driving home again from yet another visit to the city (we drive in there most days), I passed a big stake-sided semi overflowing with pumpkins. It was headed north with us on US 30, toward Sauvie and Scappoose and, eventually, Astoria. 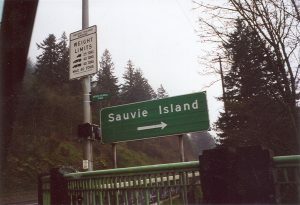 I turned to Lee and observed that we’d discovered the Secret of Sauvie Island. They don’t actually grow any pumpkins there. They truck them in. We both laughed. Sure enough, the truck pulled into the parking lot of the Pumpkin Patch. I can only assume that, when the owl crows midnight (or whatever owls do at midnight), in the dark of the moon, the truck pulls out of concealment in the PP barn and is met at the pumpkin fields by swarms of the Hispanic field hands who work on the Island, who labor mightily until sunrise, scattering the illicit fruit on the ground. 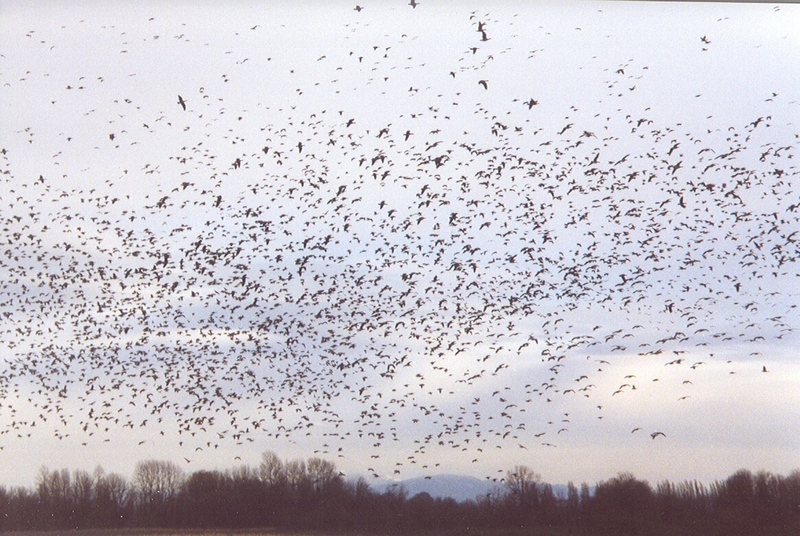 We’ve seen some very large flocks of starlings, and the usual clouds of geese, thousands and thousands of them. But the big news today is the crows. Or maybe ravens. My book says crows are 18 inches long and ravens are 24, but the pictures are just about identical. I doubt it would matter much except to an ornithologist or a crow, and I’m not even sure about the crow. So until one perches atop the bust of Pallas just inside our trailer door and croaks “Nevermore,” I’m going to call them crows. The word for a group of crows is “murder.” As in, “Look, there’s a murder of crows! Right over there, between the flock of geese and the exaltation of larks!” Well, we’ve had a lot more than that. We’ve had crows in the 1st degree, crows in the 2nd degree, and involuntary crowslaughter. We’ve had great cackling genocides of crows. They hop around on the ground outside our windows, and when I go outside they all explode into the air at once. Well, every American who has ever gone to the movies knows exactly what that reminds me of. And if Rod Taylor and Tippi Hedren come running down the road, I’m outta here.